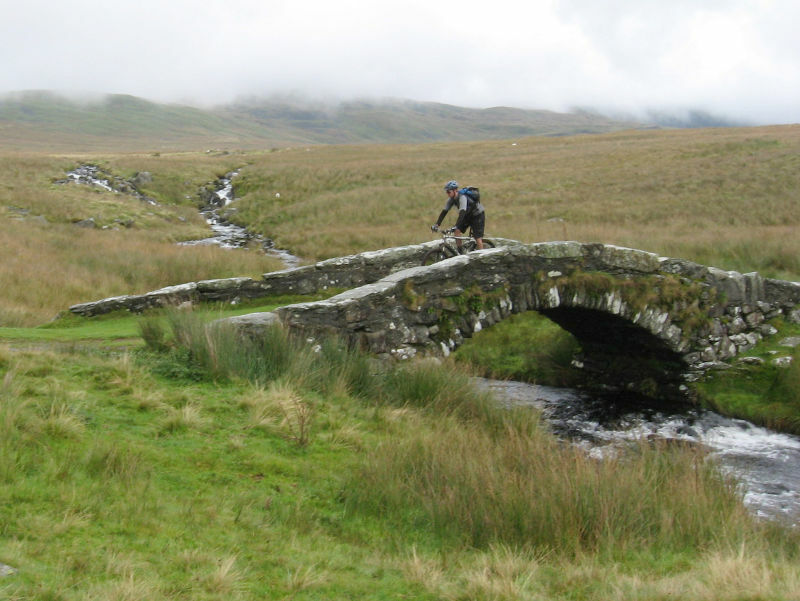 This is a mountain bike route of 29.6 miles on the western edge of the Snowdonia National Park, in North Wales. It starts from just outside Dolgellau with a gentle warm up and beautiful views on the Mawddach Trail before heading into the mountains behind Barmouth for some long, hard climbs and technical, rocky descents. 1. Start from the car park at the head of the Mawddach Trail, near Dolgellau (GR714183). Go over the cattle grid to the next car park. 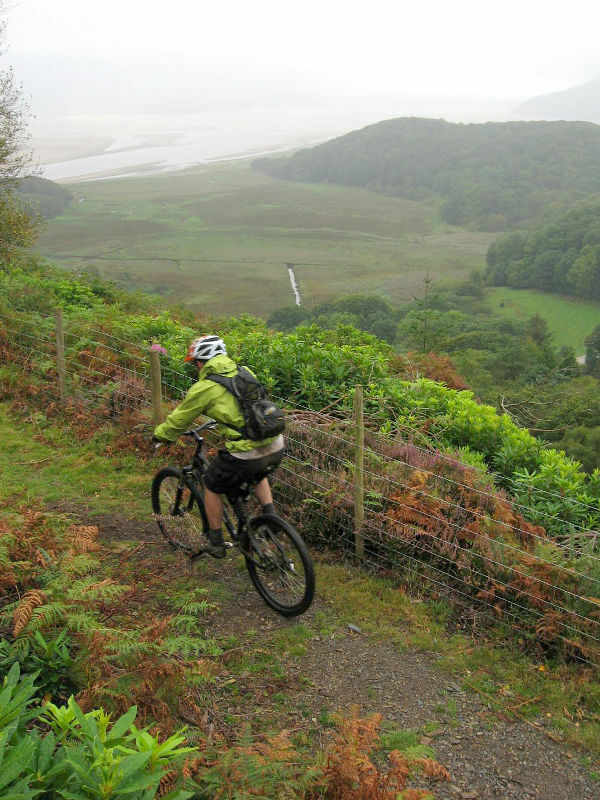 Go straight on through the gate at the start of the Mawddach Trail. Follow this wide, flat trail to the car park at the toll bridge. Go straight on through the car park and across the road, keeping the toll bridge on the right. Continue along the Mawddach Trail, on the left hand bank of the Mawddach Estuary, for 4.5 miles until it eventually comes to the railway station car park (GR629140). At this point the trail bears right through the trees, with the car park and station on the left. After the station continue along the trail as it travels parallel to the railway line and goes across the estuary on Barmouth Bridge. At the far side pay the toll then climb a short way to the main road in Barmouth (GR619156). 2. Turn right and climb a short distance to the next junction with a lane on the left, where the main road turns right. Turn left and climb the steep lane to the next junction. Go straight up the very steep lane and climb to the junction at the top (GR620158) if you don’t fancy this bit the lane that goes right at the bottom is the one you rejoin at the top. Follow the lane left and continue climbing. Go straight on at the next junction then, at the following forked junction, take the less steep lane to the right. 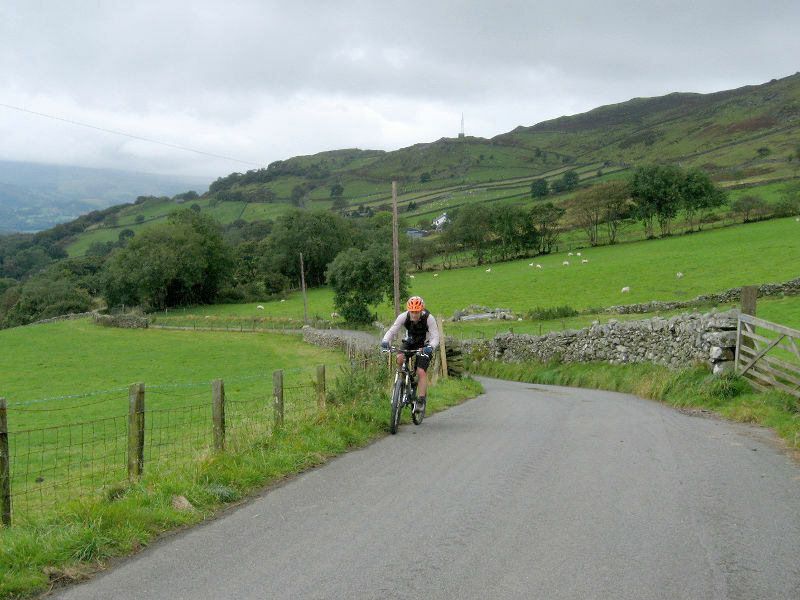 Stay on this lane and ignore any junctions to either side to climb up the left hand side of a small valley. At the end of the valley the lane kicks up left then follows the line of the mountain through a long open right hand bend past a light scattering of farm buildings. Near the end of the tarmac the lane kicks up through a left then right hand bend to a junction at Slyfean farm (GR631185). 3. Turn left and climb the wide rocky track to a gate. Go through the gate and follow the trail as it bears left then right around the contour of the mountainside. The track eventually comes to a junction with a track down to a farm building on the right. Go left and follow the main track to a junction with a wide grassy track straight ahead and a rocky track through a gate in the wall on the right (GR636200). 4. Go through the gate and follow the rocky track as it descends to cross a stream. Go past the boulders and the wide grassy track on the right and climb to a gate. After the gate continue straight on for a muddy, rocky singletrack descent. Go through the gate at the bottom and follow the trail right, keeping to the drystone wall on the right, and climb across the face of the hill. Eventually the trail kicks up to the left and comes to a gate halfway up. After the gate climb to the top and go through the left hand gate in the wall on the right. 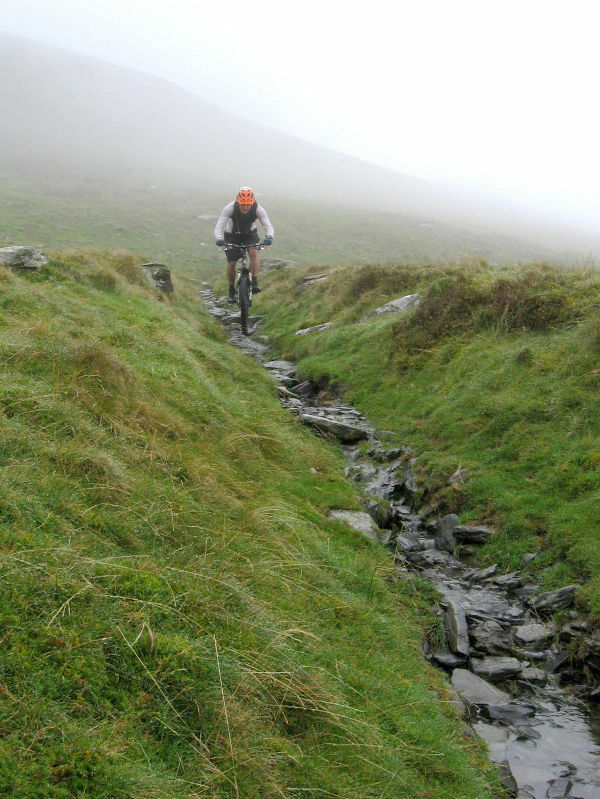 The trail then bears left and drops through a couple of bends to a junction at a drystone wall, marked by a large stone carved with ‘4M Tal-y-Bont’ (GR655202). 5. 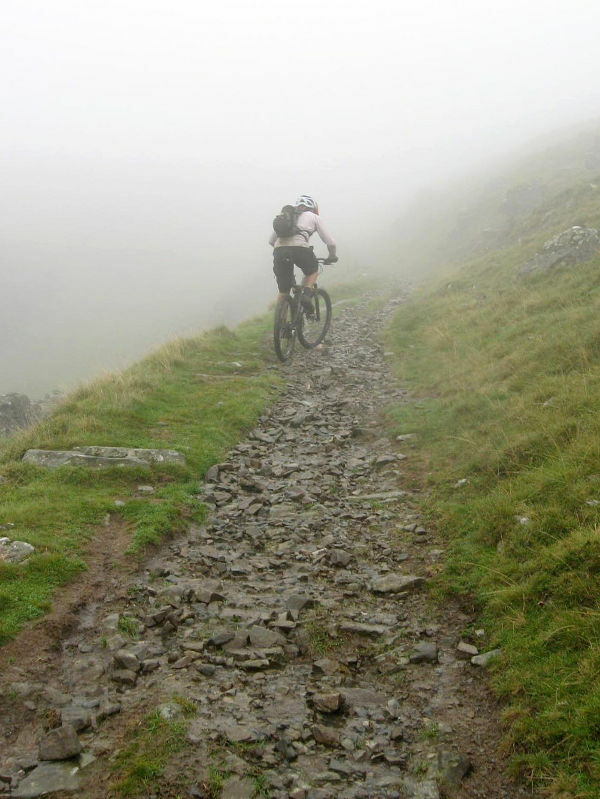 Turn left for a loose, rocky and steep singletrack climb. 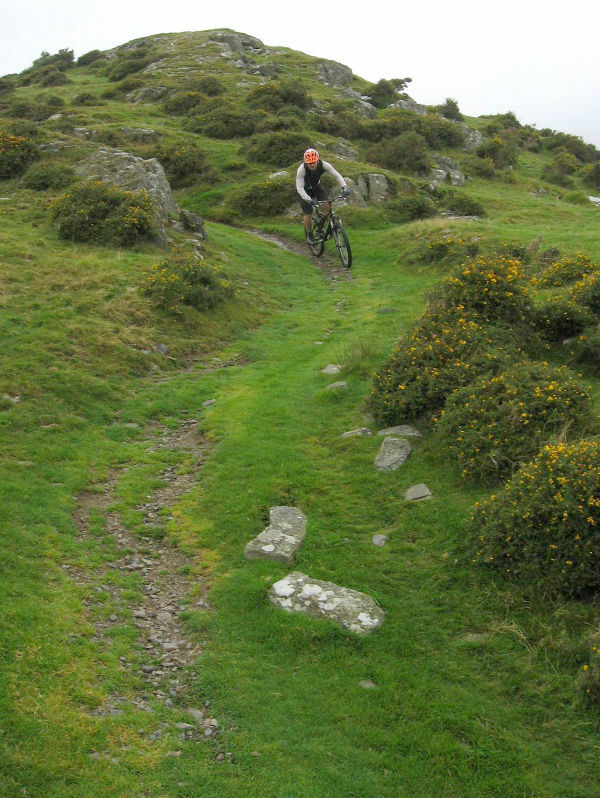 After a short distance go through the small gate and continue up the climb on a less rutted, grassy track that keeps to the wall on the left. After the next gate, where the ground kicks up straight ahead, bear right and follow the wall on the right. 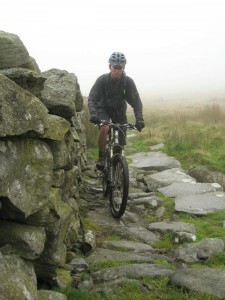 At the end of the wall go straight on and climb a few rocky sections to a drystone wall that appears ahead. Bear right and continue climbing the trail to keep the wall on the left. After the next gate the trail bears away form the wall and goes through a section of boulders before coming to gap in a drystone wall ahead (or gate if it’s been fixed). 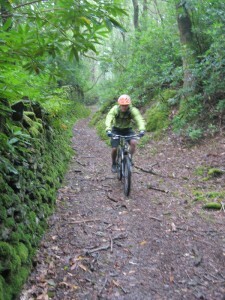 Go straight on through the wall then just before the main trail kicks up take a grassy singletrack on the left. Follow the singletrack to a gate in the wall on the left (GR646220). Go through the gate then turn right for a steep grassy and muddy climb that follows the drystone wall, now on the right. Fortunately this doesn’t last for long before it turns left and flattens off for a traverse across the top of the bowl in the mountainside. If the weather is nice there's a fantastic view of the Mawddach estuary. Near the end of the climb the trail steepens before coming to a gate in the drystone wall at the top (GR638223). 6. After the gate go straight on, past the cairn on the right, to start the descent off the mountain. Initially the track bears right for a fast grassy blast but the lower it gets the more it becomes loose, rocky and rutted. The trail eventually turns left through a hairpin where the boulders soon disappear to be replaced by large uneven slabs. Bear right on these slabs all the way down to Pont Scethin Bridge to cross the stream, by the waterfall on the right (GR634235). 7. 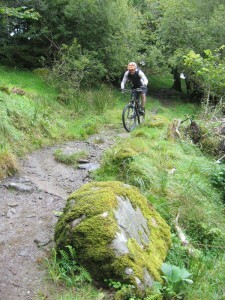 After crossing the bridge continue straight on for a muddy, rutted and rocky climb. 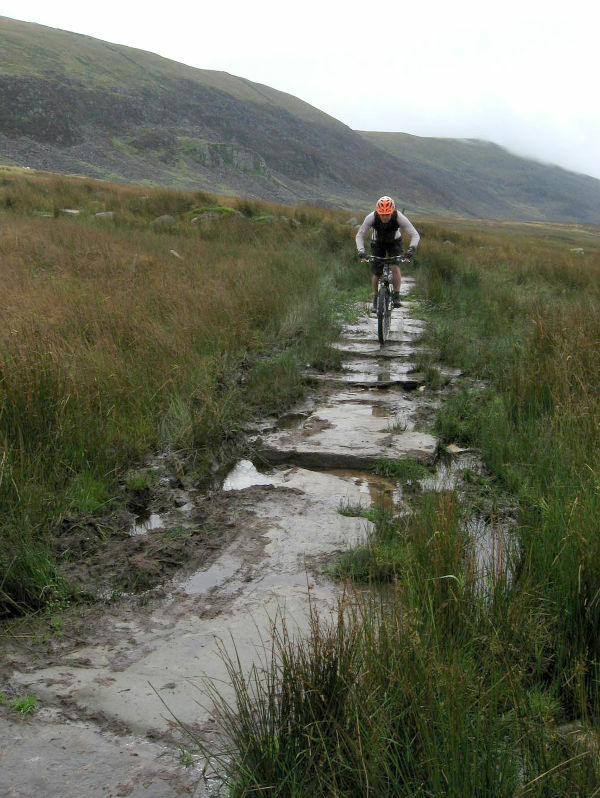 Negotiate the small but rideable bogs on the way to a junction with a wide gravel track (GR627237). Turn left on the track and descend through a few gates. The track then goes through a section of bends, with drystone walls on both sides, that ends with a left hand bend leading on to along straight. Descend through some more gates to a gated junction with a lane (GR602230). 8. After the gate turn left through the next gate to follow the lane along the flat above the woods on the right. The lane soon descends to a house on the left (GR606226). At this point turn right down the marked bridleway for a sweet bit of rocky and rooty singletrack that follows a stream through the woods. On the way down go through a gate, then turn left at the following junction and drop towards the stream. At the next junction stay left to keep by the stream. The trail then bears away from the stream and comes to a junction just after a bench on the right (GR598223). 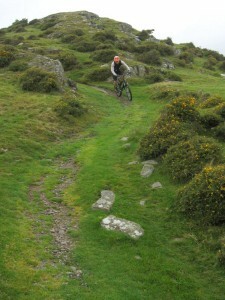 Take the wide track on the right and climb a short way to a junction. Follow the track right between the low stone walls to a junction near the camp site at the edge of the trees. Turn right and climb gently back into the woods on a wide dirt track. At the next junction turn left over the stream and go straight on through the gate. This leads on to another gate at a junction with a lane (GR597228). 9. After the gate turn right on the lane for a gentle climb. At the entrance to the Hall follow the lane right and left then left and right to climb to the previously visited junction (GR602230). Go through the gate on the right to follow the lane above the woods again. 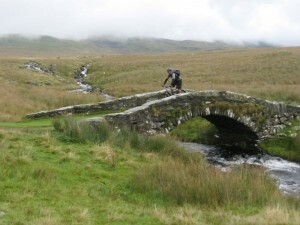 Descend past the cottage this time and go straight on through a gate then over the stone bridge. Once over the bridge follow the lane left and climb straight on to the gate at the top (GR609225). 10. After the gate turn right up the dirt track then go straight on, past a track on the left, to climb a steep grassy and rocky track straight on, following the wall on the right. Continue straight on when the incline reduces soon after and climb the grassy track studded with boulders. 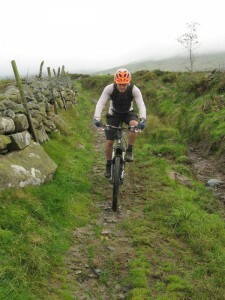 The trail then becomes muddy, rutted and rocky, following close to the drystone wall on the right. After a while it descends over a section of uneven boulders to a gate at the bottom of the final steep section of the climb (GR622206). Go through the gate and into a field. Follow the trail as it heads gradually away from the drystone wall on the left. Climb through a couple of loose rocky sections before coming to a gate in a wall on the far side of the field. After the gate the trail becomes steeper and covered in loose rocks, following a gully on the left. 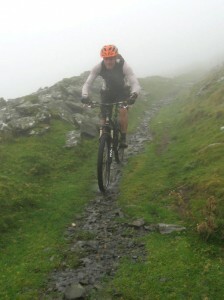 It climb gets harder as further up, with a few impossible sections near the top, but it's mostly rideable. The trail eventually levels off and comes to a gate in the drystone wall at the top (GR627200). 11. After the gate descend the rocky singletrack ahead that bears left, the trail on the right is a footpath. 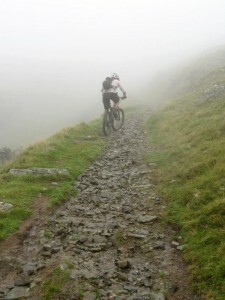 This trail starts fast and rocky then drops through a couple of loose hairpins. Go through a gate on the way down, to where the trail ends at a junction with a wide grassy track and drystone wall straight ahead. Turn right and ride a short way to the previously visited junction (GR636200). Turn left through the gate and follow the wide, rocky track over the stream to the to a junction just after, marked by some big boulders (GR639201). 12. Turn right and descend the wide grassy track. 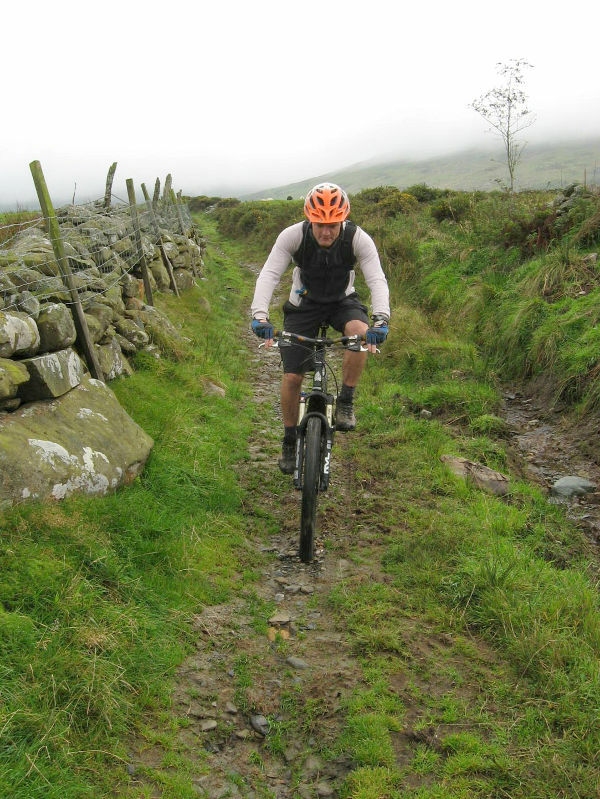 It soon becomes rutted and goes through a couple of bends before turning right to a junction, directly after going through a gap in the drystone walls at the corner of a field. 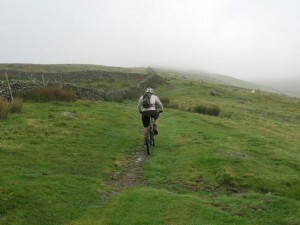 Don’t go straight on into the next field but turn left and follow the trail between the drystone walls. The trail then bears left to a junction with a footpath and a gate. Go through the gate and descend along the right hand edge of the woods. When the track comes to a lane go straight on and continue descending. Follow the lane straight down before going through a couple of tight bends to a junction just after the houses (GR642187). 13. Turn left and climb the lane into the trees. 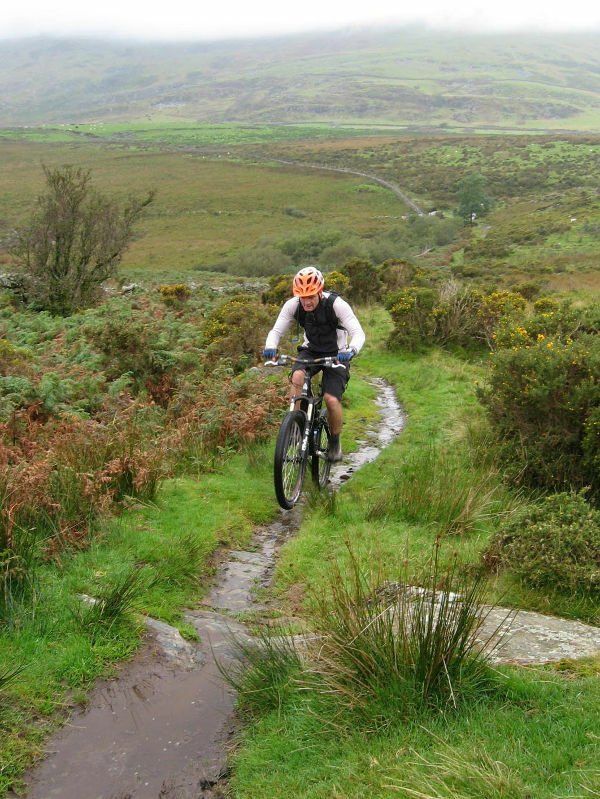 Stay on this lane as it descends to a right hand bend before crossing a short plateau. Climb the lane a short way to the crest on the other side. After the crest descend a short way down the steep tarmac to a gated track on the left hand side of a right hand bend (GR650186). 14. Go left through the gate to follow the signed bridleway. The trail soon splits at a drystone wall. Stay on the right hand side of the wall and descend the singletrack to a gate. 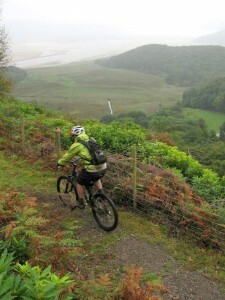 After the gate go up a short climb for a great view across the Mawddach Estuary. After the crest the trail bears left and descends to a gate leading into the trees. Go through the gate for a fantastic descent through the woods. Continue straight ahead all the way down the trail. Go through the gate at the end of the trail to join the main road, the A496 (GR660186). 15. Turn left and follow the main road for a while to the next junction on the right, signed to the Toll Bridge (GR690191). Directly after crossing the bridge turn left through the car park and follow the Mawddach Trail all the way back to the car park at the far end to finish the ride. 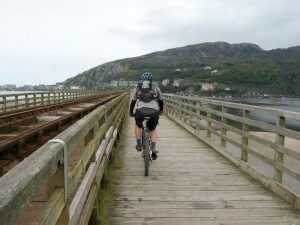 You will need £1 or so for the Barmouth Bridge toll but the second Toll Bridge is free for bikes.